With a slightly modified race route compared to 2018, the cobble stones sections have also been modified, well, that is, in the first part of the race, with the sections 29 to 24. The difficulty notes have been awarded to these sections after today's visit by Christian Prudhomme and Thierry Gouvenou and these notes have been announced in a press releases which contains the same notes for almost all of the sections which were part of the race before, except for the Troisvilles section of which only the first 900 meters will be part of the race this year. Not really surprising that the other notes are identical when you know that the criteria which are taken into account for the attribution of these notes are the length (which doesn't change, except for the Trouée d'Arenberg which has been remeasured by ASO and turns out to be 100 meters less long than what they thought so far, at 2300 meters), the irregularity of the coubles (which doesn't change, or at least not much), the general state of the portion (which doesn't change much, especially if the weather is similar; there again there's the exception of the Trouée d'Arenberg where rehabilitation works have taken place: cleaning the cobbles with high pression water and filling the gaps with mortar, the first 500 meters slightly going down are again usable and the 400 following meters will be handled the the same way after the race ... a shared jackpot will be set up to collect money for the remaining parts) and of its place in the race (which hardly ever changes). The total distance on cobble stones still is 54.5 kilometers like last year. The start in Compiègne on the Place du Général de Gaulle will be at 11AM. After the start, the riders will follow in Compiègne the Rue du Dahomey, the Place Saint-Jacques, the Rue Magenta, the Rue Jean Legendre, the Place de l'Hôtel de Ville, the Rue Solférino, the Cours Guynemer, the Rue de Soissons, and then the Avenue de l'Armistice, the N31, the D66, before they get on the D130 where the real start will take place, as usual. The riders will follow the D130 before they get to Saint-Léger-aux-Bois and Pont-l'Evêque from where they'll go on to Noyon and then, via Ham and Saint-Quentin, get on the first cobble stones section, the usual section from Troisville to Inchy, of which they'll this time thus only ride the first 900 meters. The riders will then discover the new combination of the first cobble stones sections, which includes the first feeding zone which is still in the same are but not exactly at the same location anymore, in Solesmes. What follows the section from Vertain to Saint-Martin-sur-Ecaillon is identical to the usual race route. In total the riders will thus visit 54.5 kilometers of cobble stones and they'll find a second feeding zone in Beuvry-la-Forêt. The finish will, as usual be, on the Vélodrome of Roubaix after a full lap on the track. You can use this map to plan your visit of Paris-Roubaix 2019 in detail. No excuses anymore of not having enough information provided by the organisor of the race! Since there've thus been some changes, velowire.com offers you the opportunity to compare this year's race route with last year's. 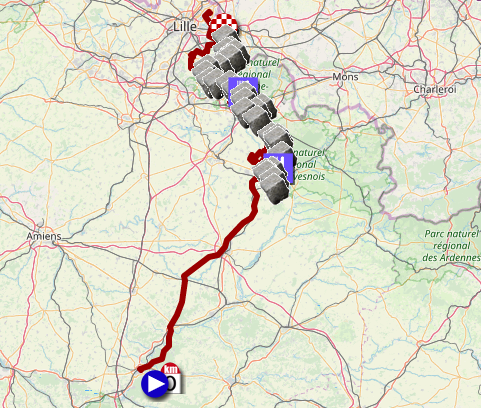 In order to do so, you can simply add last year's race route on the map by hovering your mouse over the "layers" incon in the upper right corner and check the checkbox in front of "Paris-Roubaix 2018". You can switch between the two maps or show them at the same time by checking or unchecking the different editions. This same icon also allows you to choose the map background and switch from map to satellite or terrain view. The race will, like the last three years, be broadcasted from the start till the end, in France on France Télévisions (France 3 starting at 10.50AM; between 11.50AM and 12.55PM one should switch to France 4) and on Eurosport 1 (from 10.55AM till 5.45PM)! Dank zij jullie linken naar het parcours en https://www.afstandmeten.nl/ konden wij gisteren gemakkelijk een wandeling plannen op de "secteurs pavès" 7, 6, 5 en 4 (Carrefour de l'arbre).Totale afstand +/- 14 km. What is the result of nine times seven ?